OBSERVER File Photo. Above, Dunkirk’s Phil Messina catches a ball in a game earlier this season. Messina went 5-5 in the Marauders victory over Chautauqua Lake. 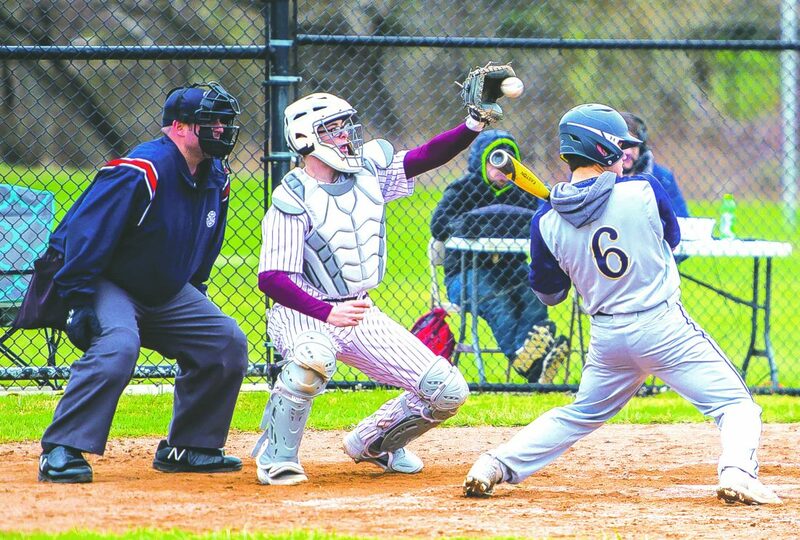 MAYVILLE — The Dunkirk Marauders (2-1, 3-1) handled Chautauqua Lake (0-4, 1-4), 9-2, in a Section VI CCAA Division 1 West baseball game at Chautauqua Lake High School, on Thursday. From the lead-off spot, Phil Messina powered the Marauders offense going 5-5 with three RBI and a stolen base in their 9-2 victory. Lucas Porpiglia started on the mound for the Marauders, but it was Tristan Skelly who finished the game. Skelly got the win after pitching five innings and giving up three hits with three strikeouts. Gavin Saurland pitched for the loss for the Thunderbirds. Zach Fischer got three hits and Cody Triana got two in the losing effort. Dunkirk will travel to Silver Creek today. Chautauqua Lake will hope to get their first league win today as they host Southwestern. BROCTON — The Brocton Bulldogs (1-0, 1-1) suffered a big loss to Falconer (3-1, 4-1), 16-2, in a Section VI nonleague baseball game at Brocton High School, on Thursday. The Bulldogs went with Ronald “Bubba” Brown on the mound and got three innings out of him. Brown gave up seven hits for eight earned runs, while striking out four. Falconer used three pitchers, seeing two innings apiece from Kal Pierce, Bobby Samuelson and Matt Gullotti. Gullotti had the strongest performance, as he got six strikeouts and Pierce was credited with the win. Brocton saw a strong offensive performance from Jordan Krystofiak, who went 2-3 with two doubles. Brown added a 2-3 performance and Nick Putcher went 1-3. The Golden Falcons had an impressive day from Samuelson at the plate — Samuelson went 4-5 with two doubles, a triple and managed to score four runs. Mark Wilcox added a 2-4 game with two doubles and three runs. The Bulldogs hope to get back in the win column today as they host Panama. Falconer will try to stay hot when they play Silver Creek at home on Monday.